Navigate the map with your mouse for some photos. Satellite_photo_©_NASA; linked photos © Terragalleria; all other photos © TransMékong except where mentioned. The delta is the southernmost part of Vietnam, South-West from Hồ Chí Minh City, which is on another river basin. 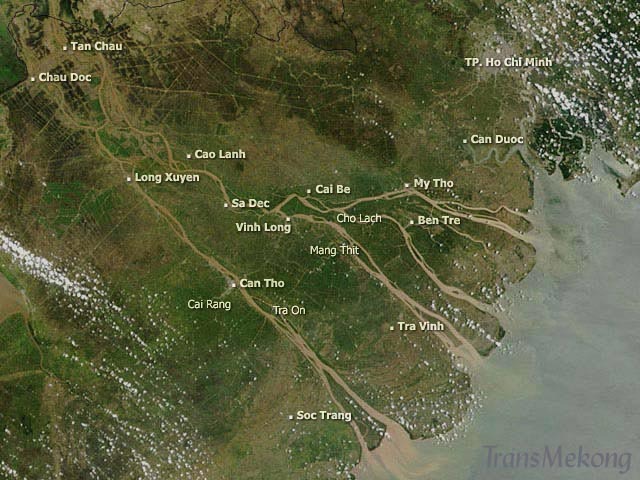 The Mekong enters Vietnam as two branches: The First River (Tiền Giang), which takes several names on the way, enters at Vĩnh Xương and flows through Tân Châu, Cao Lãnh, Sa Đéc, near Cái Bè and Mỹ Tho before exiting out at sea, and the Bassac river, entering from Cambodia just North of Châu Đốc, and flowing through Long Xuyên, Cần Thơ and near Sóc Trang before exiting ou at sea at Cửa Đình An. 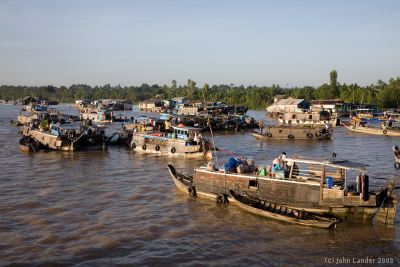 Roughly one half of the delta, North of Cần Thơ, is often flooded about the fall equinox as fresh water cannot freely flow out at sea, and the other half is less flooded, but more and more subject to the effects of saltwater from the sea. The lanscapes are thus very varied, from wide open ridefields to mangrove through coconut groves. The mean altitude of the delta is so low that the sea tides are not only felt but the current actually inverts as far North as Châu Đốc. The delta produces more than half the total agricultural produce of Vietnam, and is dubbed the "Rice basket of Vietnam". It is a very pleasant area to live, with a bountiful nature and charming people. Its being threatened by an increase in the water levels linked to global climate change makes the delta all the more precious today. Life in the countryside is very much revolving around the river and its innumerable canals and tributaries. Not only is fishing a major occupation in the region, it is essentially done by casting nets and mostly at the scale of a whole village, but for a few decades now, the inhabitants of the delta have set out to grow fish in floating fish farms, at first in the province of An Giang, North of the Bassac river, and now farther and farther downstream. The most recent evolution is fish farming in ponds, be it shrimps, tôm càng or tôm sú, or crabs, and now several sorts of fish. The landscape begins to change deeply in the vicinity of these farms. The river and its tributaries form a dense net of waterways, of which near 15,000 miles can be navigated by boats of over 100 tons in the delta alone, that is more than ten times the length of compacted road. So all the markets are near the river, and West of the Bassac, they are often afloat on the river itself, be it wholesale markets like that of Cái Răng, near Cần Thơ, or retail markets or even village markets like at Trà Ôn. All the trades pertaining to the river are represented along the banks, where you find not only agriculture producers, fruit drying facilities and small-scale cane sugar refineries, but also mechanics, wooden ship building yards and dry docks. There is little threat from the wildlife of the Mekong delta. With simple precautions, one can enjoy the pristine wilderness without discomfort. There are mosquitoes in the delta, but they are not very numerous are the water is typically not stagnant, and less so on board, as we are away from the banks. We still advise the passengers to use mosquito repellent, and when on board, simply to close the windows and doors at night in the rainy season. The spiders and arachnids in the delta are common. They may be large, but they are typically harmless, the larger species to be commonly found are insect trappers that can be seen in their webs between bamboos, branches or electric wires. Scorpions happen and can cause painful swellings. There may sometimes be small leeches in the rice fields, that may attach to one's skin. Although this is rare and we do not typically enter any rice fields and stay on firm ground, the passengers should simply take their shoes off upon boarding back and check for leeches. Should there be one, do not pull it off, but advise a member of the crew who will take care of you. Properly taken care of, they are mostly harmless. Another potential risk is the rove beetle, or paederus, similar to the Nairobi fly, that may come out with the rain. Although it does not bite or sting, it can cause serious local blisters on the skin if it is crushed or threatened, so you should just blow it off. The rove beetles may be one or two centimeters long; to some people they look like ants although they are more fluid, and they are attracted to light. Poultry is farmed extensively in the delta, which was a vector of spreading the avian flu, and although this illness has to this date failed to degenerate into a human pandemic, it is still present in the delta. We advise our passengers to simply avoid contact with the poultry and their direct living area when they come across such farming. Domestic dogs sometimes may defend their territory or that of their masters and a dog bite could happen. As there is a low but real risk of rabies, in case of a dog bite, we would then take the passengers to a hospital upon arrival to take anti-rabies shots within 24 hours. If you are worried about a sting or an animal, do not hesitate to inform your cruise director, who will help you. Our typical journeys are mostly from Cần Thơ on the Bassac to Cái Bè near the First River or back, crossing one large tributary, the Cổ Chiên river, but mostly remaining on the smaller, windier river Măng Thít and the Nicolai and Chợ Lách canals, where we have close encounters with life around the river. We also operate weekly two-night trips from Cái Bè to Cần Thơ then upstream the Bassac to Châu Đốc, then back to Cái Bè, an opportunity to link with Cambodia, but also to see the sceneries of the wider river. You may charter a whole ship as well, and follow any route you like. For instance: .